Onon Bayasglan received a CIFE Award this March for his exceptional contribution to Lansdowne . 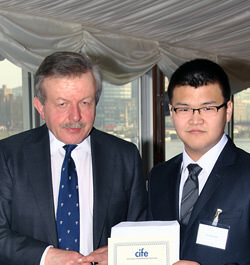 He received the award from CIFE President Lord Lexden at a ceremony in the House of Lords. Onon (pictured right with Lord Lexden) arrived a little late to the GCSE cohort at Lansdowne, but immediately he hit the ground running in an academic and extra-curricular capacity. He continues to grow in his academic development with his work ethic, drive and will to succeed. But he is not only someone who excels in the classroom; his manner and attitude to his peers and teachers exemplifies an unswerving commitment to how he presents himself as a young man. His singular attitude and sanguine nature keep him rooted in his studies, something that is essential during an intensive One Year GCSE course. Onon tackles a diverse range of subjects with command and endeavour, typified by recent A* grades in Chemistry, Business Studies, Geography and Biology.